American Eagle Bowie Knife | BUDK.com - Knives & Swords At The Lowest Prices! Add our American Eagle Bowie Knife to your collection today. The patriotic tribute piece features a bald eagle shaped cast metal pommel and the theme is continued on the white handle. It offers a 7 5/8" stainless steel blade with etched accents. 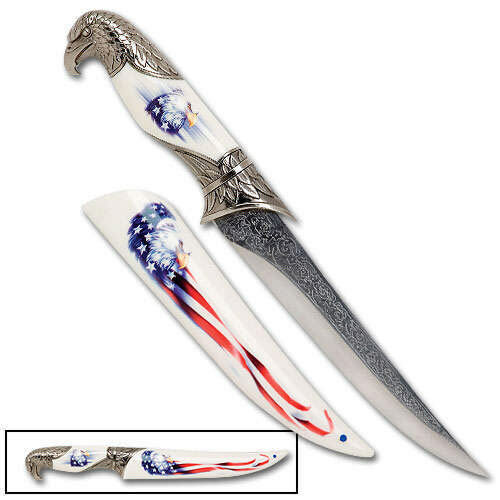 A white sheath with complementary bald eagle and American Flag artwork houses the blade. Very nice. Worthy of an Eagle Scout gift.